Infosys Technologies Ltd. is one of the largest Information Technology companies in India. It has International presence, having 63 offices and development centres around the World employing more than 122,000 persons. As a part of their strategy for in-house training of their staff, they have created "Global Education Center" at Mysore and reportedly it is the largest corporate education center in the World. It can train 14,000 candidates at one time. 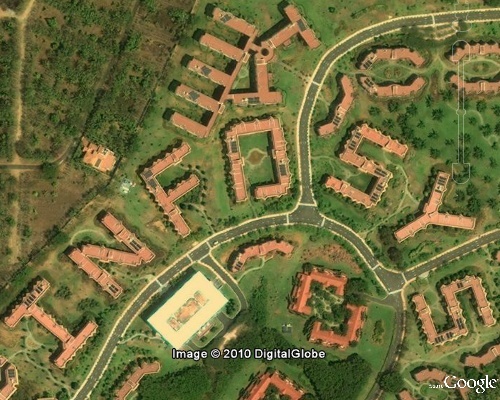 The hostel buildings for the trainees has a unique architecture - Each hostel blocks is patterned in a such a way that it represents one alphabet of their corporate name I N F O S Y S and same can be fully visualised only from air. Unfortunately I couldn't find more information on the Web as to who conceived the idea and the size of buildings etc. However looking from the aerial/satellite images these look huge and as per measurement obtained through Google Earth the alphabets have a height of about 59 metres and width of 46 metres (193 feet x 151 feet).